OxygenOS Open Beta 29 and 20 on OnePlus 3 and 3T: OnePlus is rolling out the new software update for OnePlus 3 and 3T device under the Open beta channel. This OxygenOS open beta build update is based on Android Oreo rolling out via OTA to users who are on the previous open beta version. Oneplus 3 will be updated to Open beta 29 and OnePlus 3T will be updated to Open Beta 20. OnePlus is well known for bringing the latest updates and new features to the device. This update is packed with New Notes OnePlus app, New weather widget, Quick clipboard, improved speed while deleting large files and added large files category and in the file manager, the new system-level features like notification when 3rd party apps delete contacts and OTG toggle in Quick Settings. This update also includes Android December security patch along with General bug fixes and improvements. Open Beta 29 and 20 rolling out via OTA (Over The Air) for those who are on the previous version of open beta (Open Beta 28 and 19). This is an incremental update which rolls out in phase manner. The update may take few weeks to reach all corner of the world. The fast and best way to get the OTA update is to remain on the Stock beta firmware. You can also manually check for updates in Settings -> System Updates -> Check for update. If you don’t want to wait for OTA, then you can follow the below step by step guide to manually install OxygenOS Open Beta 29 and 20 on OnePlus 3 and 3T. 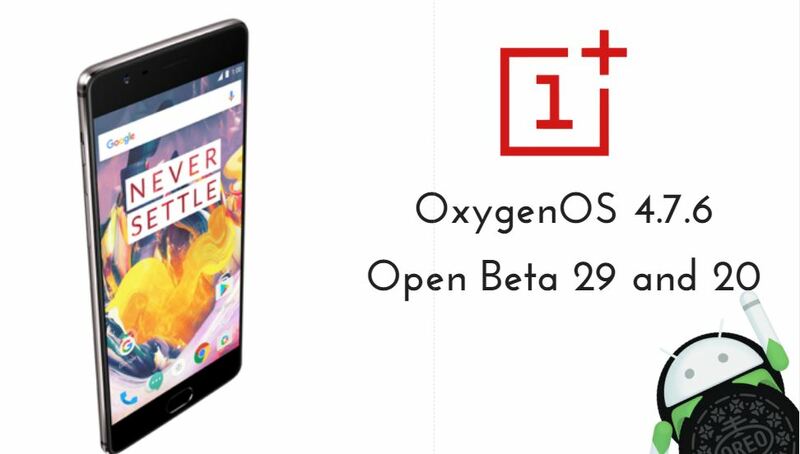 Download OxygenOS Open Beta 29 or 20 Firmware for Oneplus 3 or 3T and save it in your device. Then, switch off your phone and reboot into recovery mode. Now, Install OxygenOS Open Beta 29 or 20 executing the following command. Hope you found this article helpful. let us know your feedback on OxygenOS Open Beta 29 or 20 on OnePlus 3 and 3T.